Our Abpromise guarantee covers the use of ab55152 in the following tested applications. ab55152 staining MHC Class II in Human bowel tissue sections by Immunohistochemistry (IHC-P - paraformaldehyde-fixed, paraffin-embedded sections). Tissue was fixed with formaldehyde and blocked with 5% serum for 1 hour at 21°C; antigen retrieval was enzymatic. Samples were incubated with primary antibody (1/50 in milk) for 21 hours at 4°C. A Biotin-conjugated Rabbit anti-mouse polyclonal (1/300) was used as the secondary antibody. ICC/IF image of ab55152 stained A431 cells. The cells were 4% formaldehyde fixed (10 min) and then incubated in 1%BSA / 10% normal goat serum / 0.3M glycine in 0.1% PBS-Tween for 1h to permeabilise the cells and block non-specific protein-protein interactions. The cells were then incubated with the antibody ab55152 at 10µg/ml overnight at +4°C. The secondary antibody (green) was DyLight® 488 goat anti- mouse (ab96879) IgG (H+L) used at a 1/250 dilution for 1h. Alexa Fluor® 594 WGA was used to label plasma membranes (red) at a 1/200 dilution for 1h. DAPI was used to stain the cell nuclei (blue) at a concentration of 1.43µM. MHC Class II antibody (ab55152) used in immunohistochemistry at 5ug/ml on formalin fixed and paraffin embedded human lymph node. Overlay histogram showing Raji cells stained with ab55152 (red line). The cells were fixed with 80% methanol (5 min) and then permeabilized with 0.1% PBS-Tween for 20 min. The cells were then incubated in 1x PBS / 10% normal goat serum / 0.3M glycine to block non-specific protein-protein interactions followed by the antibody (ab55152, 0.5µg/1x106 cells) for 30 min at 22ºC. The secondary antibody used was DyLight® 488 goat anti-mouse IgG (H+L) (ab96879) at 1/500 dilution for 30 min at 22ºC. Isotype control antibody (black line) was mouse IgG2a [ICIGG2A] (ab91361, 1µg/1x106 cells) used under the same conditions. Acquisition of >5,000 events was performed. This antibody gave a positive signal in Raji cells fixed with 4% paraformaldehyde (10 min)/permeabilized with 0.1% PBS-Tween for 20 min used under the same conditions. Publishing research using ab55152? Please let us know so that we can cite the reference in this datasheet. The red is Wheat germ agglutinin (WGA). A widely used lectin in cell biology which has been conjugated to Alexa Fluor 594. WGA binds to sialic acid and N-acetylglucosaminyl residues. Apparently, my emails did not come through because the tiff files are too big. Here are the typical JEPEG pictures attached. I used MHCII ab primary as 1:100, secondary as 1:500. Everything else is the same with CXCL14. Every sample is the same pattern as the pictures shown which I think it is less likely for all of 30 tumors. Please let me know if you have any other questions. Thank you so much for your help. 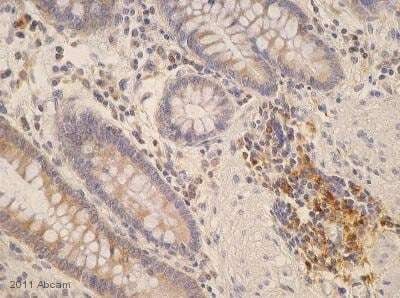 I recently ordered your antibody Anti-CXCL14 antibody (ab46010) for immunohistochemistry on human paraffin bladder tumors. After a few trials, I found out that every sample stains positive with this ab. I am not sure it is because of your antibody non-specific which caused high background. Treated samples with 3% H2O2 for 20 minutes after de-paraffin and hydration, boiled samples in 10mM sodium citrate buffer for 20 minutes between 95-100C. Then blocked samples with 5% goat serum for one hour. Then used 1:300 primary ab with 2% goat serum for O/N, 1:750 biotin-labeled secondary ab with 3% goat serum for an hour, followed by 1:250 ExtrAvidin-peroxidase for an hour. BTW, I found the same problem with your anti-MHC antibody (ab55152). I am also wondering whether your product (ab80437) EXPOSE rabbit specific HRP/DAB detection IHC kit can solve this problem. Thank you, the images all arrived. I think you are correct, the TIFF files were probably too big. Have you been able to obtain good stains for other proteins using this protocol? Other antibodies may give better stains, assuming the samples have detectable amounts of CXCL14 and MHC class II. It is unlikely, though, that the EXPOSE kit ab80437 will improve the results. Click here (or use the following: https://www.abcam.com/index.html?datasheet=128065). The image on the datasheet is of a stain that uses a different substrate than what you are using but the antibody will work with your reagents, assuming you have an anti-mouse IgG secondary antibody. If not, please reply and I will make a recommendation for a compatible secondary antibody. Click here (or use the following: https://www.abcam.com/index.html?datasheet=36622). Click here (or use the following: https://www.abcam.com/index.html?datasheet=3387). Please let me know if you need more information, and if you want to try the two antibodies that I recommend. I have searched our catalog and unfortunately we do not currently have any anti-MHC Class II antibodies which have been tested in hamster. Looking further at the hamster protein against the mouse, rat and human proteins I found that the best homologies tend to be with human and would therefore recommend using a product raised against the human protein or part of it. We do have a few products which would be appropriate, namely ab116378 and ab55152. If you are interested in testing these in hamster I could enroll you in our Abreview 100% discount program if you buy an anti MHC class II antibody now, test it in hamster and submit feedback to us in the form of an Abreview. It doesn’t matter whether the Abreview is positive or negative, we would just really like to receive your feedback. The discount would be to the value of 1 free PRIMARY ANTIBODY. 1. Reply to this e-mail to let me know that you would like to proceed and which product you would like to test. I will then send a discount code. This code must be issued before purchasing so please wait for my reply before ordering. 3. Test it in hamster. We are always pleased to obtain feedback about our products and any information is greatly appreciated! Even if the antibody turns out to be unsuitable for hamster, you will still receive the discount on your next purchase after your Abreview has been submitted. I am getting a high background (many non specific bands) using ab55152 to detect human B cell extracts. Can't determine which if any bands are the target protein. Have used primary dilutions of 1:500, 1:1000. I am sorry this product did not perform as stated on the datasheet and for the inconvenience this has caused. As requested, I have issued a free of charge replacement for one vial of ab116378. To check the status of the order please contact our Customer Service team and reference this number. Please note that this free of charge replacement vial is also covered by our Abpromise guarantee. Should you still be experiencing difficulties, or if you have any further questions, please do not hesitate to let us know. I wish you the best of luck with your research.